For more than four years, the faces of those killed in the District have circled through the top of Homicide Watch DC. Children, teenagers, adults, the elderly. In photos they smile, or scowl. They’re pictured laughing, looking cool, or sometimes angry. It can be too much to look at. To see who we’ve lost is to remember that each of them has family and friends, teachers, co-workers and neighbors. The community of people who’ve joined us here on Homicide Watch DC have opened their stories and the justice system for us in an incredible way. Since launching in 2010, Homicide Watch DC has tracked the cases of 320 people arrested for murder in the District. We track how those cases end in our database, whether in conviction or acquittal. At the end of 2014, 96 suspects are still making their way through the court system. They are awaiting preliminary hearings, indictment or trial, a process that can take years. Most cases end with a plea deal: 116 of the cases we’ve followed saw a defendant plead guilty, usually to something less than the original charge. Second-degree murder has been the most common conviction, with voluntary manslaughter close behind. Two D.C. men were arrested Wednesday in connection with the the Christmas Eve shooting death of 28-year-old Gregory Lee, MPD announced. Deon Edward Cole, 19, was ordered held Tuesday after he was arrested on suspicion of second-degree murder while armed for the July 2013 fatal shooting of Walter Goode Jr. Responding to a report of “man down,” police found Goode, 53, behind a building in the 1100 block of First Place Northwest suffering from multiple gunshot wounds. Goode was lying on his back against a concrete wall wearing a backpack. He had a $50 dollar bill clutched in his right hand, according to documents. He died on the scene. Police recovered multiple nine millimeter shell casings and bullet fragments near Goode’s body. Filed under: Deon Edward Cole, Walter Goode Jr.
Police have identified the man shot to death in the 2600 block of Sherman Avenue Northwest on Christmas Eve as Alem Habteymer. Habteymer, 57, was one of four people killed on Christmas Eve last week. A D.C. man was killed in a afternoon shooting Tuesday in the 600 Block of Division Avenue Northeast. At 1:54 p.m., after responding to a call for gunfire, police found Gregory Brown, 27, suffering from a gunshot wound. He was taken to a nearby hospital where he died. The Glock 17, 9mm semi-automatic pistol is linked to more D.C. homicides in the last six years than any other gun, making it D.C.’s deadliest firearm. According to data from the Department of Forensic Sciences (DFS), 350 firearms have been recovered from homicides since 2009. 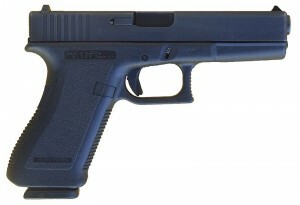 A “second generation” Glock 17, identified by the checkering on the front and rear straps of the pistol grip and trigger guard. Source: Wikipedia. Semi-automatic pistols were used in homicides more than any other design. The Smith & Wesson revolver is second on the list after semi-automatics. The data shows that criminals who shoot to kill are four times more likely to use a semi-automatic handgun than a revolver.